“Be grounded and real…and don’t be afraid to be yourself,” says Jay Pharoah of Saturday Night Live. Jay gives us his best advice for both speakers and comedic performance in a video at INC.Video The Playbook. 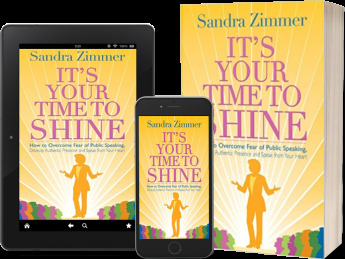 Being grounded in your body and being real with your emotions are two foundational skills in all Sandra Zimmer Method group speaking experiences. Grounding and being real are the first two skills I teach in all my coaching for speaking in groups, meetings and presentations. These two core skills result in a freedom to speak from your heart that far outshines speaking skills that are based on mechanical perfection. Jay says to unleash and be yourself. That is what all great speakers and performers know how to do. But, what does it mean to be yourself? Being yourself means to be able to share your real experiences, what has happened to you, what is happening now to you. That includes your real thoughts and feelings about your experiences. When you can talk from your authentic insides, there is congruence between your insides and what you express on the outside. You are real, you are then being yourself. Being yourself is the hardest thing you have to learn as a speaker or performer, but it’s what makes you a star! Let me help you become a star at speaking and performing. How to Receive a Standing Ovation – Get Naked!